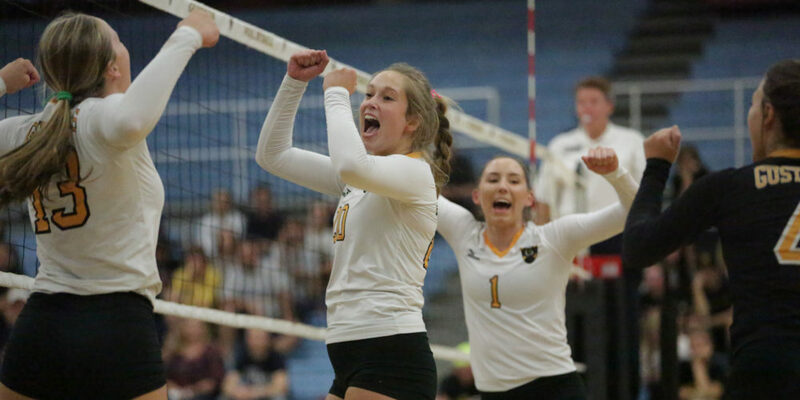 ST. PETER, Minn. – The rematch of the 2015 MIAC Volleyball Championship didn’t disappoint Wednesday night as Gustavus upended No. 12-ranked Bethel University in a five-set thriller. The MIAC opener victory moves the Gusties to 8-2 overall and 1-0 in the league, while the Royals drop to 8-2 overall and 0-1 in the conference. Nora Holtan set career highs in assists, kills, and digs in the five-set win over Bethel. Nora Holtan (So., Rochester, Minn.) continued to impress as the Gustie setter tallied her second career triple double – the first coming against Bethel in last year’s title game. Holtan finished with career-highs in assists (55), kills (16), and digs (22), to go along with an incredible .593 attack percentage (16-27 with zero errors). Hanna Albers (So., St. Louis, Mo.) also had a big game with a team-high 19 kills on 59 attempts and seven errors for a .203 attack rate. Lauren Hanson (So., Redwood Falls, Minn.) was next in line with 17 kills (.271), while Brittany Luethmers (So., Prior Lake, Minn.) dug out 29 attacks. 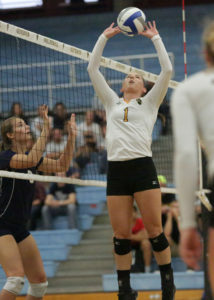 The Gusties and Royals battled point-for-point early in the first set, leading to a 10-10 tie, but that’s when Gustavus took control with a 7-3 run. Bethel fired right back and stole the momentum with a 11-1 run and won the set 25-20. Gustavus responded by taking a 7-3 advantage early in the second, forcing a Bethel timeout. The Royals would come within two points at 10-8 and 11-9, but the Gusties kept extending their lead en route to a convincing 11-point victory. Hanna Albers posted a career-high 24 kills. The Royals had to battle from behind in the third set, trailing 9-3 in the early-going. At that point the tides turned and the visitors went on an 11-4 run to claim a 14-13 lead. The Black and Gold reclaimed the lead with a 6-2 spree, but once again the Royals fought back and won the following seven volleys, which included three consecutive service aces, and won the set 25-21. With their backs against the walls, the Gusties jumped out to a 7-5 lead in the fourth. Bethel responded with six straight points to put the pressure back on the home squad. Gustavus answered by slowly climbing back into the lead, eventually taking a 15-14 advantage and forcing a Bethel timeout. 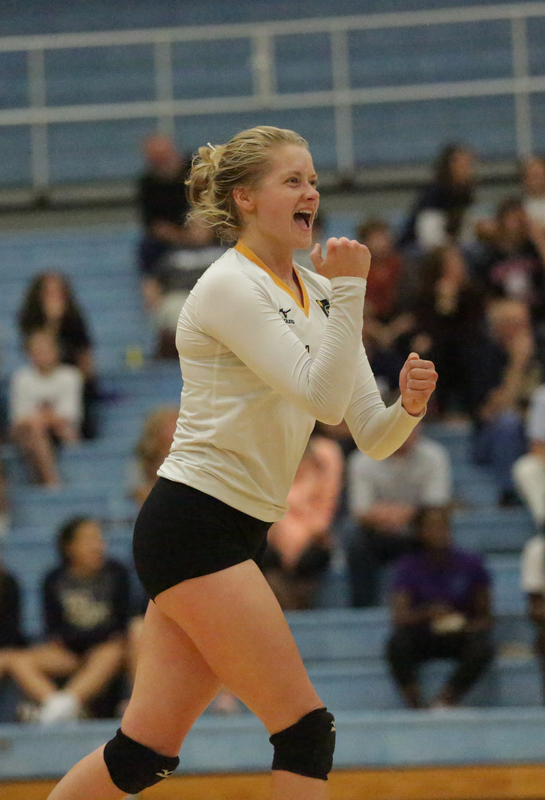 The Gusties never let go of the lead and forced a deciding fifth set with a 25-22 win. The Royals maintained a lead for the first 13 volleys of the fifth set, but the Gusties came through in the clutch with a 8-2 run, forcing two Bethel timeouts in the process. The final kill came from Hanson, set up by Holtan, for a 15-11 victory. Gustavus was efficient on the attack, hitting at a .274 clip, compared to a .165 rate by the Royals. Gustavus next travels to Eau Claire, Wis. on Saturday to face Lakeland and Dominican in the UW-Eau Claire Tournament.